Artists, curators, and venue coordinators all gathered on Friday, February 23, 2018 for the chance to take part in various workshops, roundtable discussions and presentations. The annual event was held at 106 South Division. “Break it Down, Make it Better" is an event gathering creative minds in the Grand Rapids community for an opportunity to have conversations with one another on a range of topics related to being an artist. 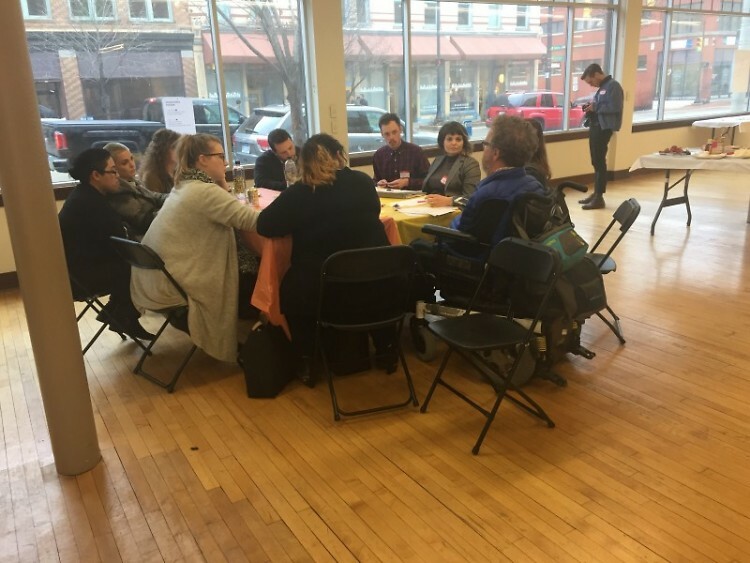 Artists, curators, and venue coordinators all gathered on Friday, February 23, 2018 for the chance to take part in various workshops, roundtable discussions, and presentations. The annual event was held at 106 South Division. In total, there were 29 different discussions that took place on topics that focused on the place art has in building a community that’s diverse and impactful on individuals lives. In a discussion titled “Using Your Privilege to Advocate for Inclusion,” Kathy Keehn covered how individuals and institutions can identify having certain privileges to be more inclusive, and understanding certain barriers that exist as well that lead to organizations and institutions being exclusive. She said she enjoyed the discussion and was impressed by the respect everyone involved in the conversation had of each other, despite it being a difficult topic for most to talk about. “It's wonderful that the organizations have provided a forum for this,” she said. Angelika Lee led a conversation titled “Telling Your Story to Build an Audience,” along with Mariah Cowsert. She said everyone in the discussion was very engaged and adept at understanding what story they’re trying to tell. She said this opportunity gave everyone at the table the chance to give feedback the way each person wants to deliver their story. “It's really valuable just to have the space and time to be able to do that,” Lee said. Brett Colley led the discussion “Art as Resistance,” which talked about the politics art can play into at times. In the discussion, they talked about the type of world they wanted to live in, versus what they did not want to live in. He said artists are sometimes guilty of only showing atrocities and horrors of the world without much of an optimistic light. Colley said he had not anticipated how involved everyone would be in the discussion, and appreciated how little he had to talk. He added that having these discussions feels like a plant being watered that hasn’t been in a long time. The annual event was organized in part by members of the organizations Dwelling Place and Creative Many, in addition to ArtPrize. Jenn Schaub, a Neighborhood Specialist at Dwelling Place who helped to organize the event, said the purpose of the event was to get creative minds from the community to get together and have a dialogue. She said she was pleased by the growth made this year to expand the types of people who participated in the event. “I think this was much more successful from previous years. We had creative persons from a variety of backgrounds, at all levels of their careers, who participate in making art of all different kinds,” Schaub said via email. Schaub said she hopes the event has empowered the creative sector to grow in Grand Rapids. “My hope is that people will connect with one another, be inspired, find ways to collaborate in the future and/or walk away with a sense of inspiration and community,” she said.